Mt Vesuvius (1281m)towers over Naples in Italy and is probably the most famous volcano in the world owing to its devastating eruption in AD79 which buried the Roman cities of Herculaneum and Pompeii. Vesuvius has been active for 25,000 years and last erupted in 1944. 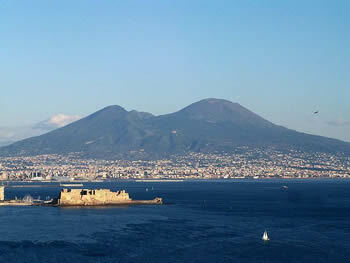 Modern day Naples sprawls under this sleeping volcano, fingers crossed she stays quiet. Vesuvius is a stratovolcano composed of layers of ash and lava.The main cone Gran Cono (1281m)was formed in the AD79 eruption and sits within a caldera caused by the collapse of a larger cone called Monte Somme (1149m).Vesuvius owes its existence to the subduction of the African plate below the European plate along a convergent or destructive boundary. 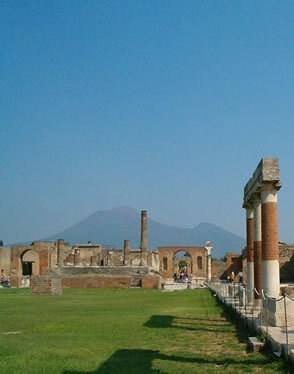 Vesuvius is part of the Campanian Arc, which runs down the Italian Peninsula. 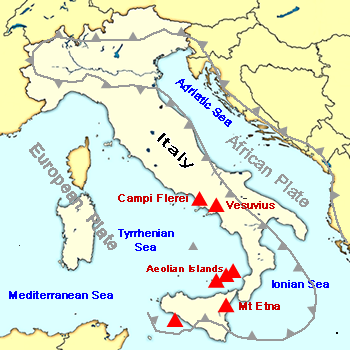 The adriatic portion of the African plate is subducting beneath the Eastern shore of Italy. The slab beneath Vesuvius has detached creating a slab window which alters the copostion of the rocks erupted from the volcano. Vesuvius erupts in a Plinian style. In Ad 79 Pliny the Younger documented the eruption , which described a vertical column of smoke which spread out like an umbrella higher in the atmosphere. As the eruption looses its upward power the column and cloud collapse depositing large volumes of pumice and scoria. Pyroclastic clouds plunge down the volcanoes sides consuming everything in their path. It is the pyroclastic flows which eventually finished off the remaining inhabitants of Pompeii. Pliny the elder was a naval commander killed by the eruption whilst attempting to rescue people and observe the volcano. In 1944 Vesuvius erupted again and pumped ash clouds into the sky. The town of San Sebastiano had already been destroyed by lava in 1822,1855 and 1872 and now faced the lava again. A ten foot high wall of lava invaded the town and destroyed buildings yet again. What to see and How to see it? The car park at 1000m is the place to start your circuit of Vesuvius s crater. There is a 1.5km long track to the crater rim from here for which you will have to pay a fee. It is a steep track which should take around 30 minutes to an hour.The crater rim walk may be closed in bad weather. The crater walk round the AD79 crater is spectacular as you look down into the chasm over 300m deep. 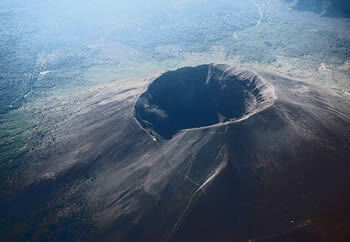 If you wish to descend to the crater floor contact the Club Alpino Italiano who may arrange a suitable guide. Lavas from the 1944 eruption partially cover the crater floor and you may see fumaroles. The car park has snack bars and mineral stores which sell minerals from nowhere near Vesuvius! There is a paved road to a car park at 1000m . The train also links Ercolano with Pompeii. Buses leave from Pompeii Tourist information for around 10 Euros and more unreliably from Ercolano. Pompeii was a prosperous Roman City complete with Amphitheatre and Forum. It was a popular destination for Romans on holiday. It has been extensively excavated from its covering of volcanic ash and pumice and is fantastic to wander around. Walk into houses that feel like the owners have just popped out of and see original paintings and frescos on the walls. Wander past fast food stalls Roman style and cross over chariot rutted roads.There are even political slogans written on walls in Latin and a brothel. Some of the population no doubt fled at the first rumblings from Vesuvius but others reamined as the ash and debris rained down on them blocking streets and doorways. It was eventually overwhelmed by at least 6 Pyroclastic flows or surges which are hot avalanches of gas,ash and rocks which move at incredible speed. Nothing survives a pyroclastic flow and many citizens were entombed in their dieing positions as they were overcome by the flows. Plaster has been poured into the moulds left by the bodies and can be seen Antiquarium near Porta Marina. Take the private train line Circumvesuviana that runs between Naples and Sorrento. Get off at Pompei Scavi. If you take the Naples to Poggiomarino get off at Pompeii Santuario. SITA bus runs from Naples to Salerno stops at Pompei in the piazza Esedra. Pompeii exit from Autostrada A3. Three day pass to access five sites: Herculaneum, Pompeii, Oplontis, Stabiae, Boscoreale for €18. You can leave luggage and backpacks at the Left Luggage departments at Porta Marina and Piazza Anfiteatro. Hercalaneum is Pompeiis lesser known neighbour but is just as fascinating. Hercalaneum was a seaside port on the southern slopes on Vesuvius. It was overwhelmed by a series of Pyroclastic flows just like Pompeii. In arched chambers by the shore near the Suburban Thermae (Town Baths) hundreds of skeletons were found fruitlessly sheltering from the pyroclastic flows. Charred door frames from the orginal buildings and mosaics survive intact. There is a rarely preserved intact Roman theatre which can seat 3000. A seat of learning carbonised scrolls have been recovered and read. Hercalaneum is within the not too pretty modern town of Ercalano. It is reachable by train on the Naples to Sorrento line and vice versa where a walk down the hill and through the town will bring you to the site. An entrance fee is payable.